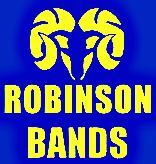 The Ultimate All-Out RBOPO Sponsored Fundraiser for Robinson Secondary School Band and Orchestra. Thank you for helping our kids make music! ​Music programs throughout the country depend on support from organizations such as RBOPO to maintain their tradition of musical excellence. Your TAG DAY contribution will be used to fund uniforms for more than 20 performing ensembles, new instruments and music, visits from guest conductors and clinicians, and the many other needs of our band and orchestra students. On TAG DAY, members of the high school bands and orchestras canvas neighborhoods in the Robinson area to solicit tax deductible contributions in support of their instrumental music program. A ‘tag’ is left for those neighbors not found at home for their voluntary use in providing support, either by mail or online via PayPal. Due to your contributions, we can offer one of the finest instrumental music programs available in Northern Virginia. With bands under the direction of Andrew Loft, Kinsey Holland and Judy Einuis, and orchestras under the direction of Anne Rupert and Francesca Fitzgerald, more than 750 middle and high school students are musically enriched through their participation in these outstanding and award winning ensembles. Thank you for your support of music education and the James W. Robinson Band & Orchestra programs.